Handcrafted Titanium Pendant Necklace in Pink from Mexico, "Nautilus Spiral"
Designed by Mexican artisan Diana Solis, this pendant necklace is inspired by the beauty of the nautilus shell. Solis enjoys working with titanium, inspired by the ease with which she can alter the color of the metal. 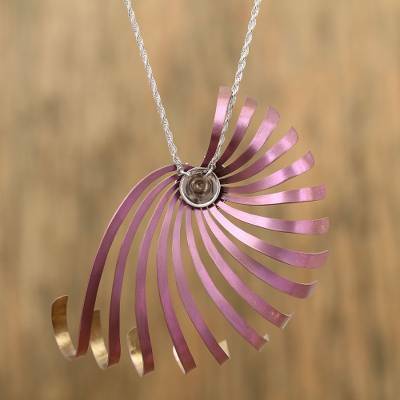 The pendant features a spiraling design of shining pink titanium, accentuated with sterling silver. The necklace adorns the wearer on sterling serpentine chain. You can find titanium pendant necklace 'Nautilus Spiral' by Diana Solis in jewelry categories such as No Stone Necklaces, Silver Necklaces, Sterling Silver Necklaces, Titanium Necklaces and Pendant Necklaces. Enjoy exploring these sections for other Novica treasures.